Dear guests and historically interested! I am very glad that you have found your way here. In the next few lines I would like to bring you closer to how three emperors, a skilful move, thorough genealogy, many generations of Radlinger and an excerpt from the Austrian State Archives leads to the fact that even today the Radlinger carries a coat of arms of the Radlinger. The origin of the coat of arms of the family Radlinger can be dated pretty much on the 20.09.1564. On this day Emperor Maximilian II awarded by crest letter the original coat of arms to Simon Radlinger. This symbol, which was once only given to those who served your lord well and faithfully, was decorated with a golden griffin, which sat on a black mountain and held a white wheel in its front paws. Above the shield was a helmet with black and yellow helmet covers to one side and red and white to the other side. A helmet bulge of these four colors finally emerged again the yellow griffin with the white wheel. However, until the coat of arms resembles that, as it still graces the Hotel Radlinger today, it will still need another generation of Radlinger. But who was Simon Radlinger and what did he do to achieve this honor? Unfortunately, little was known about him from excerpts from the Austrian State Archives. 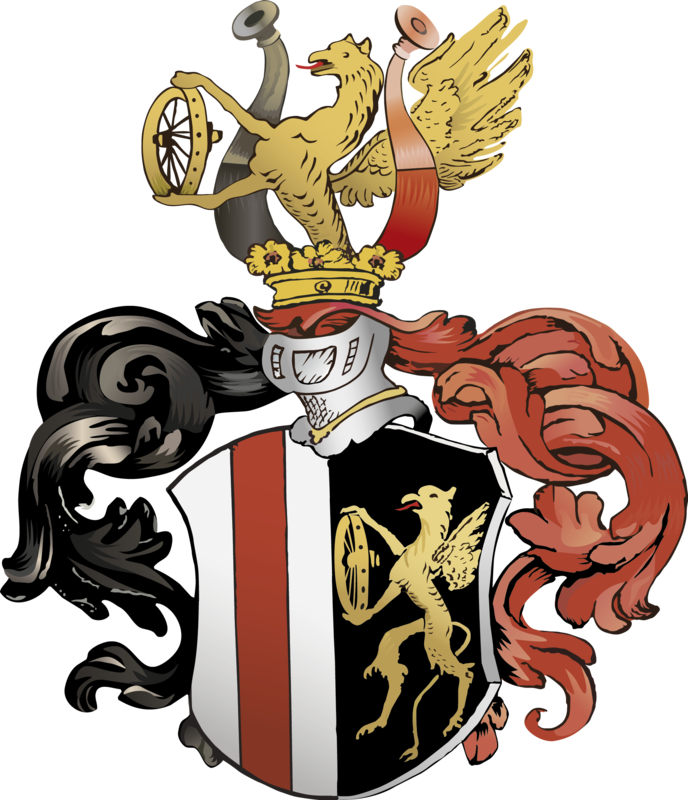 But what one strongly suspects is that in addition to many deeds he has done with certainty, it was ultimately the procreation of his son Michael, which made him the ancestor of the Radlinger coat of arms. In the coat of arms letter the faithful and diligent work of Michael Radlinger is mentioned as Hofkaplan emperor Ferdinands I. The actual merit of the coat of arms is therefore due to the zealous chaplain, who received the coat of arms as a farewell gift after finishing his court service by Ferdinand's successor Maximilian II. But how did Simon Radlinger achieve the honor of the coat of arms, you may now ask yourself. The answer is simpler and more present than you might think. One simply did not want to be "the new one", the upstart, the rookie. Therefore, the wise heads of bygone days often had their own father, if he still lived, all honor. Thus, one was not the Arrivierte, but the one to whom the coat of arms was already inherited and which it was basically from birth. However, a by-product of this misguidance was that, of course, all other children of Simon Radlinger also received this honor. In the case of Michael, however, this had particular weight because he himself, as a Catholic clergyman, could have no legitimate offspring. It would take almost another 30 years before the history of the coat of arms took the next turn. A good story from the past of Central Europe should, as everyone knows, contain at least three emperors. The third in our history is, in order to go far, Rudolf II Emperor of the Holy Roman Empire, King of Bohemia and King of Hungary and Archduke of Austria. It was he who exhibited the nobility letter to the brothers Mathias and Adam Rädlinger on 09.10.1593. What the gentlemen deserve this honor might not be beyond our scope but certainly the maximum number of characters allowed in this text box. I'm sure one or the other, so those who have not skipped it anyway, will suspect a spelling mistake behind Rädlinger now. If so, he certainly did not spring from my pen, but rather a legacy of the arbitrary name tachograph of that time. No matter if with a or ä, the two brothers could in any case call Simon Radlinger, the ancestor of the Radlinger coat of arms, as their ancestor. Thus you were nephews or grandnephews of the former imperial chaplain. With the Adelung it finally came to the present appearance of the Radlinger coat of arms. The bourgeois spiked helmet was replaced by a noble tournament helmet and the shield was split vertically. This now shows next to the griffin also a red post on a white field. And even today, more than 4 centuries later, a version of this coat of arms decorates the Hotel Radlinger.